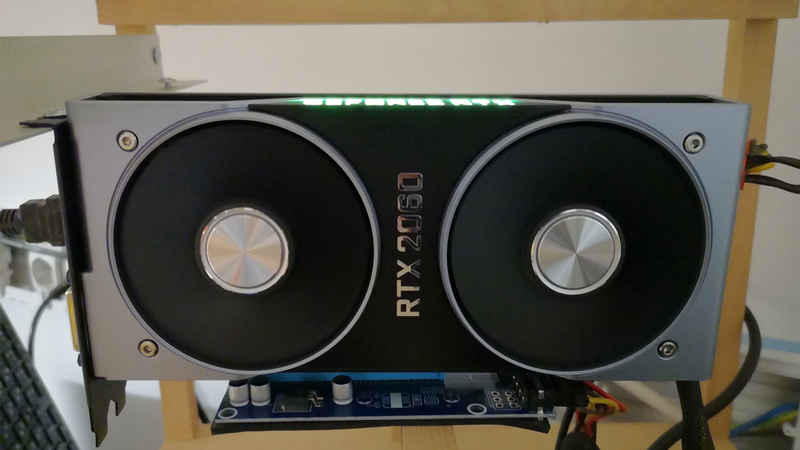 We have beeing playing for a couple of days with one of the new reference design Nvidia RTX 2060 video cards and tried how well it performs for crypto mining using various miners and mining algorithms and as expected with new GPU releases there is more to be desired, but more on that in a moment. We like the design and implementation of the whole cooling solution from Nvidia on their GeForce RTX 2060 Founders Edition cards, though there will be a lot of custom partner designs as well. The later should be available in a couple of days as well and start hitting the market pretty soon by the time Nvidia starts delivering FE cards in a couple of days. One thing that we don’t like very much with the latest RTX 20×0 series is the fact that the Founders Edition cards are only being sold directly by Nvidia and only available in a limited number of countries worldwide and the same goes for the RTX 2060 FE. The Nvidia GeForce RTX 2060 Founders Edition is equipped with a single 8-pin PCI-E power connector (up to 150W power) plus the maximum power provided by the PCI-E slot (max 75W) which should offer enough headroom for additional overclocking over the stock 160 W TDP (100%). You can go up to 118% TDP or about 189 Watts with a tool like MSI Afterburner on the FE. We are yet to play a bit more with the overclocking capabilities of the video card’s GPU as well as the onboard GDDR6 memory, even though the memory bus on the RTX 2060 is just 192-bit the fast 14 Gbps GDDR6 video memory still manages to provide pretty high memory bandwidth. The cooling solution and the fans are doing good job at keeping the video card at below 60 degrees Celsius operating temperature even under 100% load with 160W TDP with 30 degrees ambient temperature. The cooler is well built with high-quality and durable fans, so this should ensure long lasting and problem free operation as we are used to with FE cards unless there is some factory issue or a design flaw, something that unfortunately can always happen. In the table above you can see some of our initial tests with various miners and using some of the different algorithms they support. As expected with the GPU releases the miners are not yet optimized or may even not support the new GPU at all like in the case of Bminer that spits out an error regardless of the algorithm. Other miners tend to crash on certain of the supported algorithms when ran on the RTX 2060 with the default settings. Since it is a new GPU after a bit of time we can see additional performance boost when the new video cards hit the market and miner developers get access to them and start playing around. For now the new RTX 2060 does not seem very attractive for crypto mining, but hopefully soon it will be better supported and offer even better hashrates. Until we also see some more positive move and the crypto market starting to recover however the demand for the new RTX 20×0 series and not only for the RTX 2060 probably won’t be big for sure. ← Bitcoin Price Analysis: BTC Slide 6.1%, Bull Party Over?